Universal Pictures has released a new Australian trailer for Illumination Entertainment's CGI animated adaptation of Dr. Seuss' The Lorax. This new trailer shows off some new extended footage that wasn't included in the domestic trailer that was previously released. Illumination is the animation studio that brought us of Despicable Me and Hop. 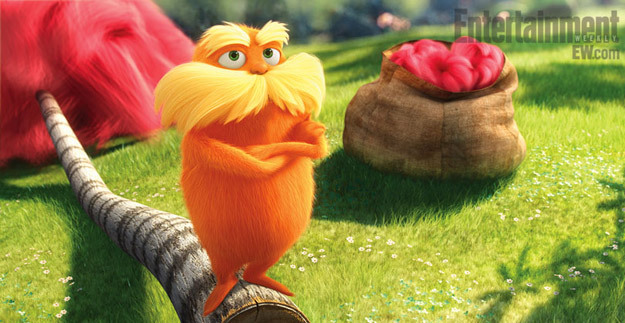 I didn't really care for either of those films, but the Lorax looks like it could actually end up being a solidly charming film. The movie stars the voices of Danny DeVito, Zac Efron, Ed Helms, Rob Riggle,Taylor Swift and Betty White. The story tells the tale of a forest creature who shares the enduring power of hope. The animated adventure follows the journey of a boy as he searches for the one thing that will enable him to win the affection of the girl of his dreams. To find it he must discover the Lorax, the grumpy yet charming creature who fights to protect his world. The movie is set to be released on March 2nd 2011. Check out the Australian trailer below and tell us what you think!